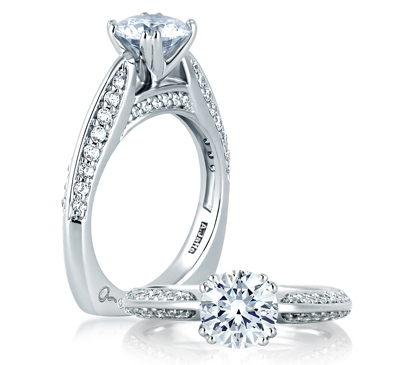 Matheu’s Fine Watches & Jewelry is proud to offer the entire line of A Jaffe engagement rings. Our engagement ring specialists will help you find a ring that is just as unique and beautiful as the woman you will be presenting it to. Visit Matheu’s in Highlands Ranch, Colorado or Breckenridge, Colorado, to find the perfect ring for the moment she says yes. At Matheu’s, we recognize the importance of your choice in the perfect engagement ring and the distinct, individual decision that is involved in choosing a ring she will wear for the rest of her life. 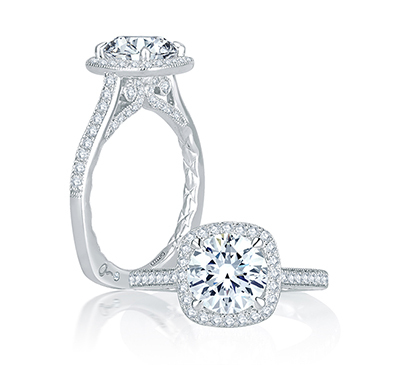 A Jaffe engagement rings are the industry standard in exceptional craftsmanship and quality. 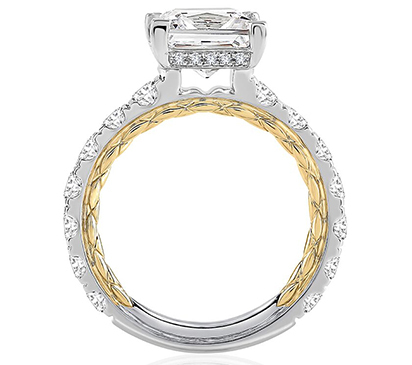 Standing on a heritage of over 120 years, A. Jaffe rings are a time honored tradition. Abraham Jaffe, a 26 year old entrepreneur, opened the original A. Jaffe store on Maiden Lane in downtown New York City, in 1892. Later, he moved his business to west 47th street, an iconic stretch of road, which would eventually become a hot spot for the international jewelry market. It takes up to 80 hours to create a single A. Jaffe ring. Each diamond is hand chosen and rings are crafted by Master Jewelers, each one possessing at least 10 years experience and many being handed down the art from the generations before them. All rings are finished with the A. Jaffe signature squaring of the shank, to minimize twisting of the ring on her finger and maximize comfort. The A Jaffe engagement rings collection at Matheu’s include stunning rings for all different styles and tastes, such as Art Deco, Classic Styles, Metropolitan, Seasons of Love and Pirouette. The Art Deco Collection is inspired by 1920s trends. Vintage rings sparkle with the same old fashioned style as your old fashioned love. Geometric shapes and straight lines accent a chic appearance and the ring itself speaks of simpler times for lovers. 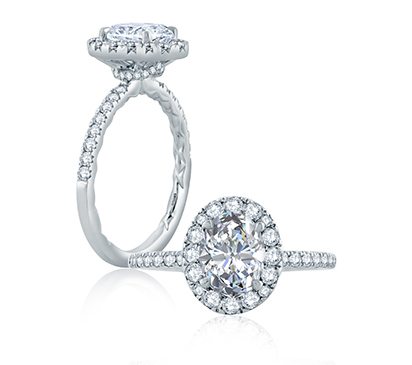 The Classic Collection Solitaire is a beautiful choice if your girl loves a timeless piece of jewelry. She will be stunned when you slip a sparkling solitaire diamond on her finger. The iconic symbol of an impending matrimony, the diamond solitaire classic engagement ring speaks for itself. 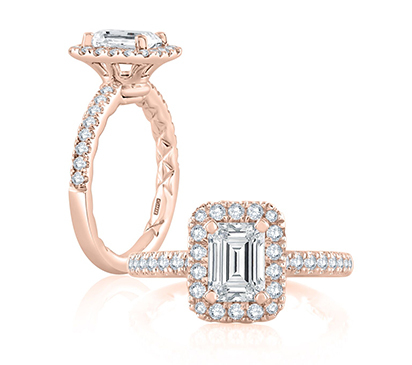 The Metropolitan Collection makes a statement of sophistication and class, with square or round settings and bands with multiple inlaid diamonds on each side of the center stone. Choose from intricate designs, as captivating and confident in their presentation as she is. Her love is warm and breezy, much like the delicate and warm toned designs of the Pirouette collection. Understated elegance meets romantic tones in this lovely collection. Matheu’s is an authorized dealer of all A. Jaffe engagement rings. Visit locations in both Highlands Ranch and Breckenridge Colorado for the most extensive jewelry collection and attentive staff in the Denver Metro Area. When it’s time to pop the question, rest assured Matheu’s is here for you. Please call (303) 471-8463 or submit an Online Request to learn more or to schedule a showing.